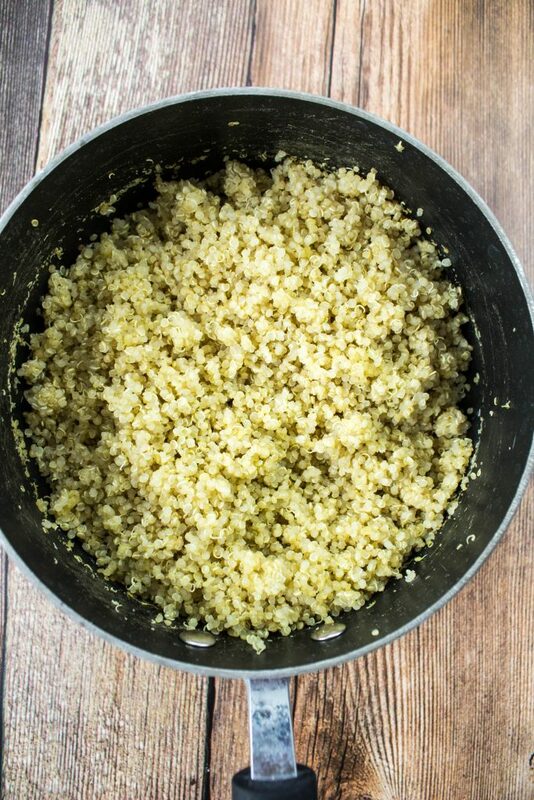 Cilantro Lime Quinoa is fluffy quinoa mixed with cilantro & lime juice is light, zesty, & full of flavor. Great for burrito bowls! Weight Watchers friendly- 3 SmartPoints! Burrito bowls are one of my favorite quick dinners to make. Who needs to go out to Chipotle and buy a burrito bowl when you can just make one at home! My Cilantro Lime Quinoa is the perfect addition to a burrito bowl or as a side for any dish! 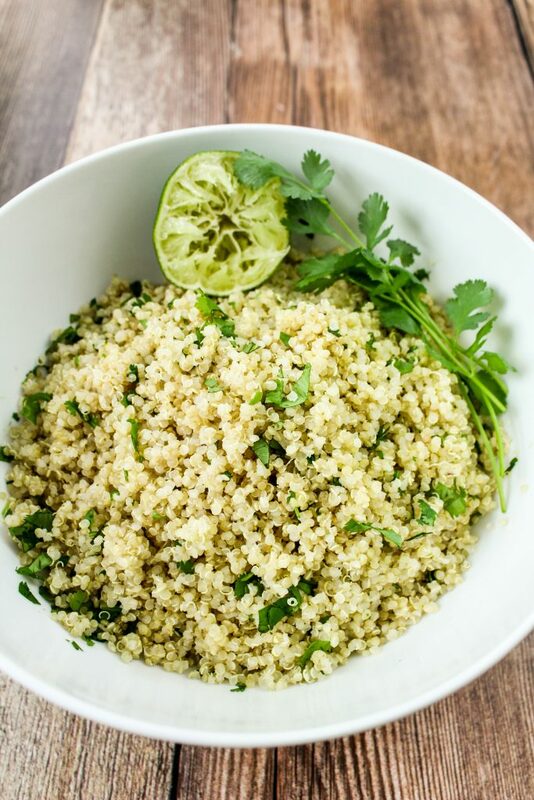 Fluffy quinoa mixed with fresh cilantro and lime juice is light, zesty, and full of flavor. This is a Weight Watchers friendly recipe and half a cup is 3 SmartPoints. Chipotle has one of the best restaurant concepts ever. You go in and get to make your own burrito, or burrito bowl, based on all the ingredients they have to offer. I feel like every time I go, my burrito bowl is different from the time before… which I love! What I also love about Chipotle is the fact that you can eat there, get amazing delicious food, and still be within daily Weight Watchers points. A while back, I worked in Human Resources at a restaurant chain that was similar to Chipotle. My first two weeks on the job, I got to train at an actual restaurant and learn the ins and outs of how all of the delicious food is made. It was HEAVEN. I learned so much and had tons of fun. That is really the inspiration for this Cilantro Lime Quinoa recipe. After working at a restaurant, I learned that I can easily make burrito bowls at home. Now, don’t get me wrong…. I still love going to the burrito restaurants because they have options that I just don’t feel like making at home! Rather than using rice, I decided to turn the restaurant cilantro lime rice into cilantro lime quinoa. Quinoa is one of my favorite food ever to eat and I honestly like it more than rice! It has less carbs, less fat, and it’s delicious. When I make this, I like to serve the quinoa as a side for grilled chicken, or as the base of a burrito bowl. I pretty much always have quinoa, cilantro, and limes on hand so I can make this in a jiffy! To a pot, add quinoa and water. Bring pot to a bowl, then reduce heat to simmer, cover, and let cook for 15 minutes. Remove from heat and fluff the quinoa with a fork. To the quinoa, add fresh chopped cilantro, lime juice, and salt. Mix well and serve! 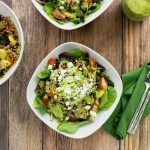 Cilantro Lime Quinoa is the perfect addition to a burrito bowl or as a side for any dish! 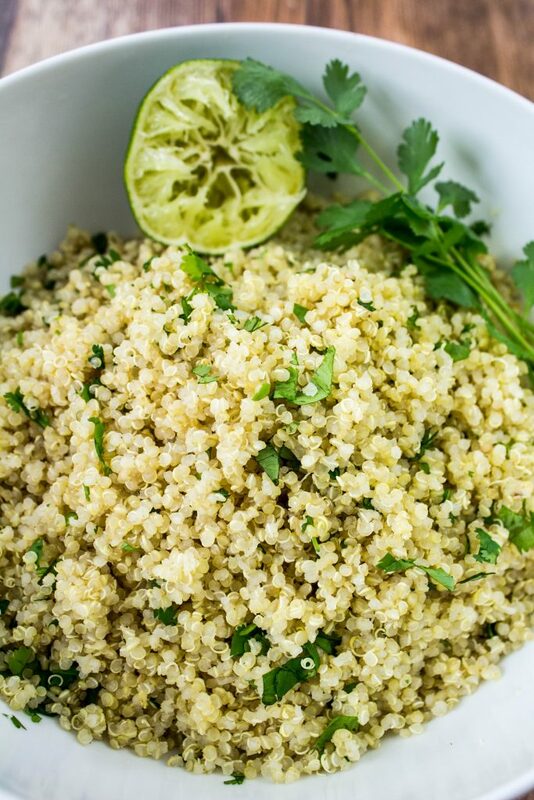 Fluffy quinoa mixed with fresh cilantro and lime juice is light, zesty, and full of flavor. 3 SmartPoints for half a cup! 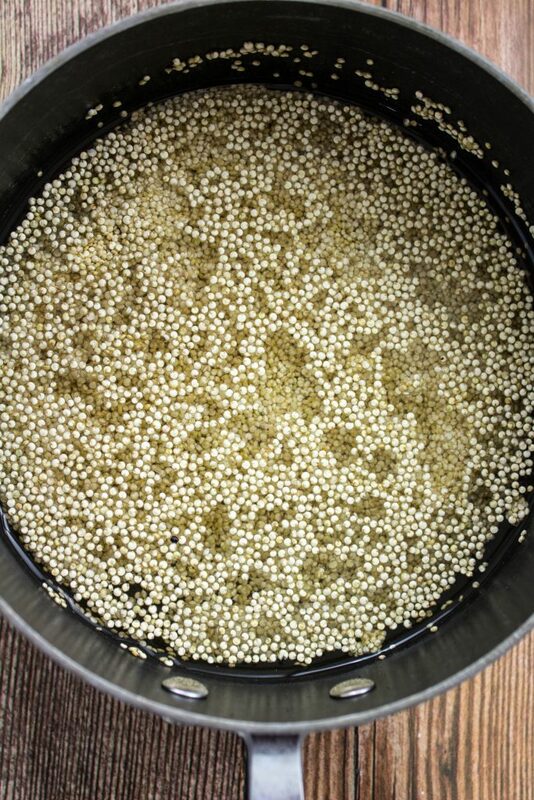 Add quinoa and water to a pot and bring to a boil. Reduced heat to simmer, cover, and cook for 15 minutes. Add lime juice and cilantro. June 6, 2017 at 11:15 am I so enjoy how flexible quinoa is! I've never thought to use like and cilantro with it although I use orange and balsamic a lot! Can't wait to try this! June 8, 2017 at 12:02 pm Thanks Hannah! 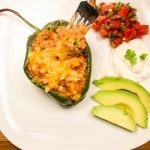 June 6, 2017 at 12:34 pm I LOVE burrito bowls! I'll have to try this instead, I'm also a quinoa fan! June 6, 2017 at 1:33 pm This sounds delicious and seems so easy. I am planning to make burritos tonight and this makes a great healthy alternative to white rice. June 8, 2017 at 12:01 pm OH perfect!! I love to use quinoa instead of rice. Thanks Amanda! 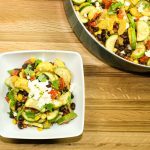 June 6, 2017 at 2:20 pm I'm always looking for new quinoa recipes! This seems so light and summery. Thanks! Marie, Mamma's Cooking recently posted...Nutella in a smoothie? Yes, please! June 6, 2017 at 3:01 pm Yes! This will be a perfect new addition to tacos and burrito bowls. I'm so excited to try. June 8, 2017 at 11:59 am Yes, perfect for summer :) Thanks Helene! June 6, 2017 at 5:32 pm YUM, sounds like this would make for some delicious (and healthy!) burrito bowls! June 8, 2017 at 11:58 am Thanks Jessica! June 8, 2017 at 11:57 am Yes, it is :) Thanks Nicole!! 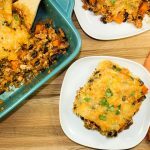 June 7, 2017 at 12:22 pm This seems like a great way to flavor up quinoa! I just love lime. June 8, 2017 at 11:56 am Thanks Julie! June 8, 2017 at 1:56 pm Saw this on Insta - looks so tasty! We're going to whip up some next weekend when our friends come over for game night & a taco bar!